The forecast was looking pretty good for the weekend and there was a general consensus that a mission was in order for this weekend. 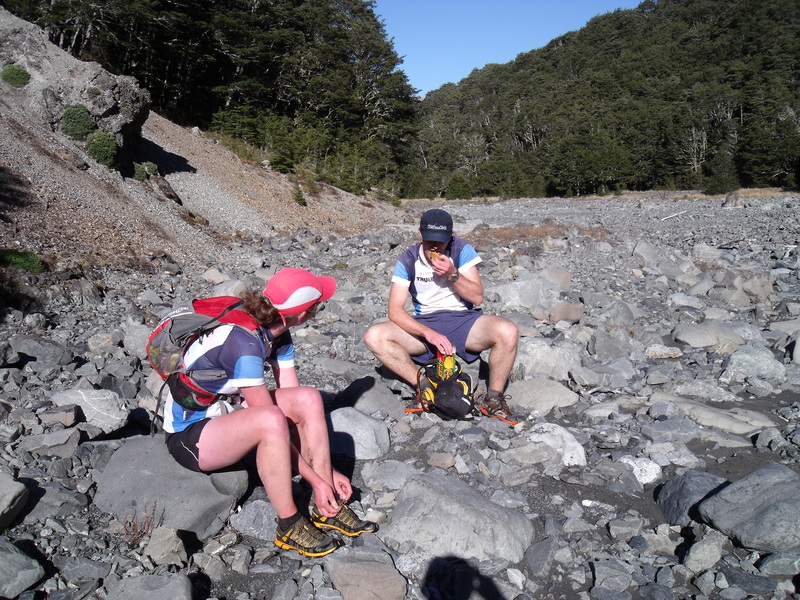 Initially after some Friday evening rock climbing I was planning on joining in on the mission to Mt Grey….but when I got home I was convinced (it wasnt very hard) to go on the Cass-Lagoon Saddle mission with Greig and Georgia. 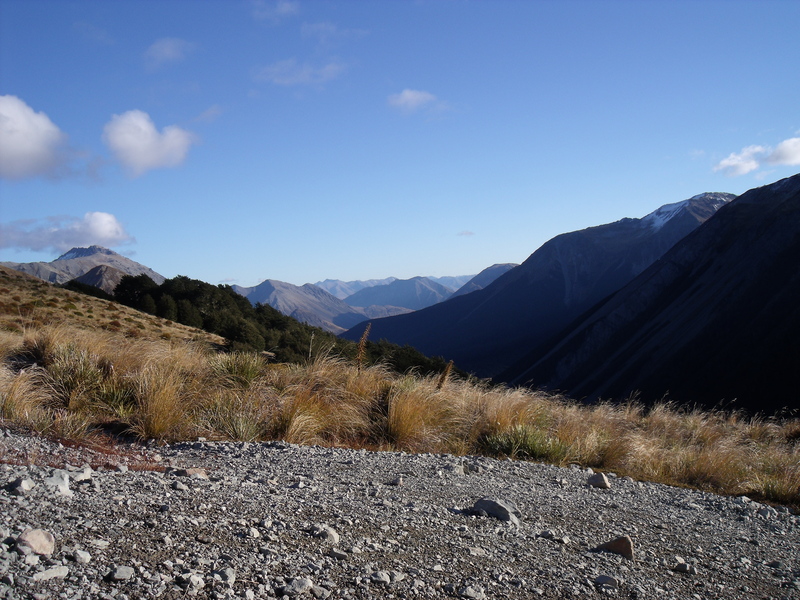 After an early morning start I jumped on my bike and headed through the misty Christchurch suburbs getting quite lost on the way but eventually I made it to Greig’s place where we jumped in the car and headed across the plains to Arthur’s Pass. At the Cass end of the track I dropped my bike and gear off to do the Car shuttle at the end of the day. 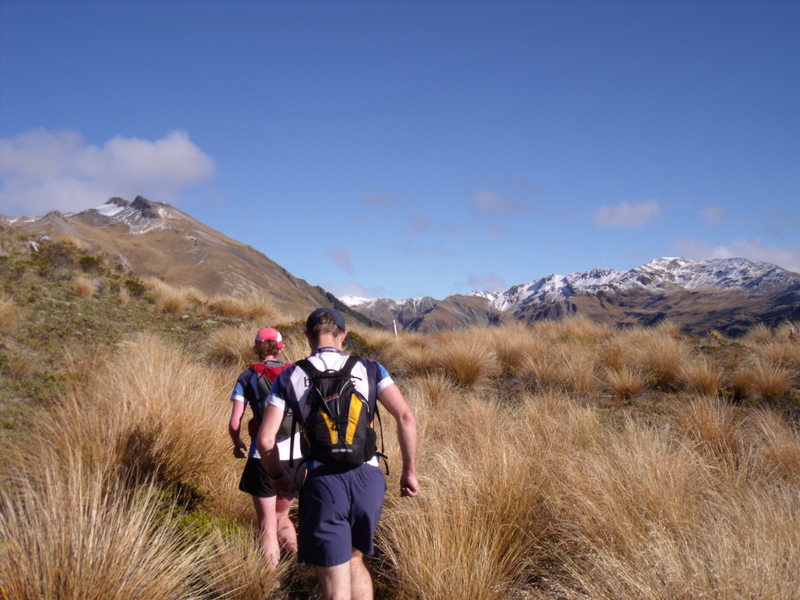 Finally we got running and gently made our way up and over the Lagoon saddle. We made good time to here then hooned down the valley and across some river flats. I followed Greig closely as he skimmed across the rock, then all of a sudden he lost his footing and went down hard, in impressive fashion too. Luckily and surprisingly from my angle he was ok! I must have shaken him a little bit because about minutes later we ended up off the track and getting pretty close to some sort of gorge so we climbed up a steep hill and found the track pretty soon after. Hamilton Hut arrived at around 2pm and with about half of the run behind us it became apparent that I might not get back to my bike in time for sunset…and I had no light for my bike either! It was hard work leaving the hut as it is a very nice one with a big sunny deck and one worth visiting again someday! Then it came time to leave the sun a head into the shadow of the hill above. After a steep climb it was back into the sun on top of Cass Saddle. A bit of a rest was in order at the top, in the perfectly calm and very pleasant surroundings. As the sun was going down fast it was time for me to take the lead and run to pick up the car. So I left Georgia and Greig and hooned down the valley, getting a little bit lost in the river bed near the end but eventually I made it across the river flats and down the rows of trees to my bike just on Sunset. A quick transition I jumped on the bike and began my epic ride to beat the decline of the day light and to get off the main road as fast as possible as it was not very fun riding down a main hi-way with no lights! I ran out of water halfway down the river valley and didn’t have time to stop and fill up and now the lack of water was beginning to take its toll. Eventually I hit the gravel road and the minute I got to the car it was instantly dark. I required a little bit of feeding before I could muster the energy to pack my gear into the car then cruised through to pick up Georgia and Greig who were getting cold waiting in the car park. The trip home required a stop off at the Darfield fish and chip shop for some much-needed replacement calories and a nice cold can of lemonade! You did 33 km in one day? Not bad… with driving from christchurch and the bike shuttle. End of May is also not the longest daylight! Haha, yeah it was a long day!